The most famous monetary policy rule undoubtedly is the so-called Taylor rule, which basically tells monetary policy makers to set the key monetary policy interest rates as a function of on the one hand the inflation rate relative to the inflation target and on the other hand the output gap. The Taylor rule is rather simple and seems to at least historically have been a pretty good indicator of the actual policy followed by particularly the Federal Reserve. Often the Taylor rule is taken to be the “optimal” monetary policy rule. That of course is not necessarily the case. Rather one should see the Taylor rule as a empirical representation of actual historical Fed policy. A similar rule which has gotten much less attention than the Taylor rule, but which essentially is the same thing is the so-called Mankiw rule. Greg Mankiw originally spelled out his rule in a paper on US monetary policy in the 1990s. 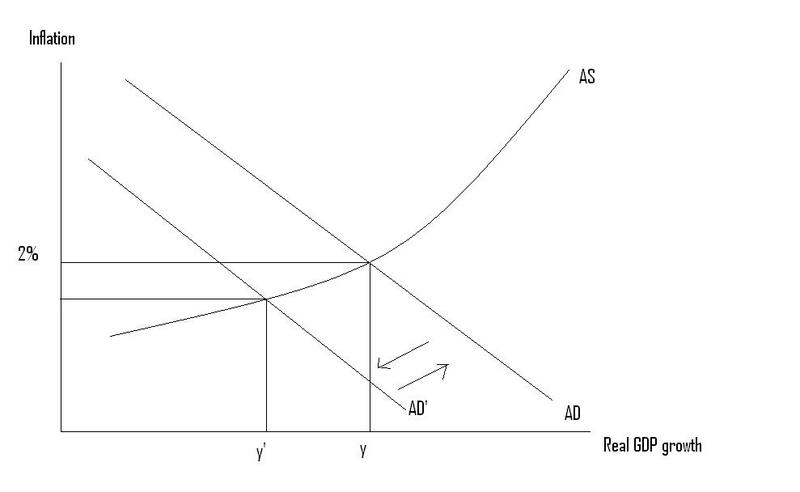 The graph below shows the original Mankiw rule versus actual Fed policy. 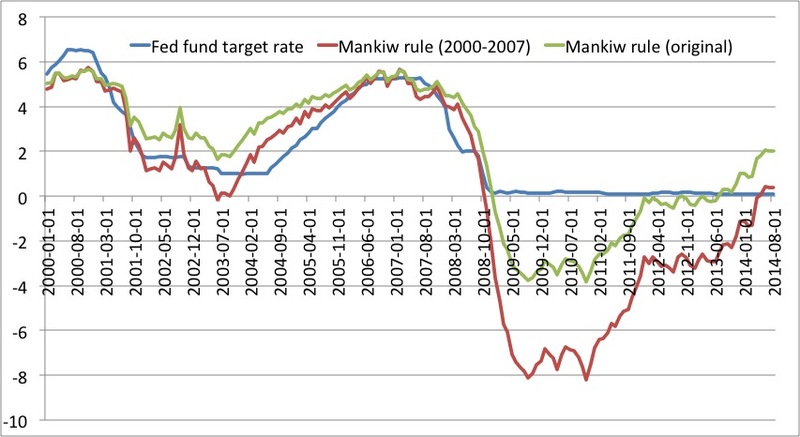 We see the Mankiw rule more or less precisely captures the actual movements up and down in the Fed funds rate from 2000 to 2008. 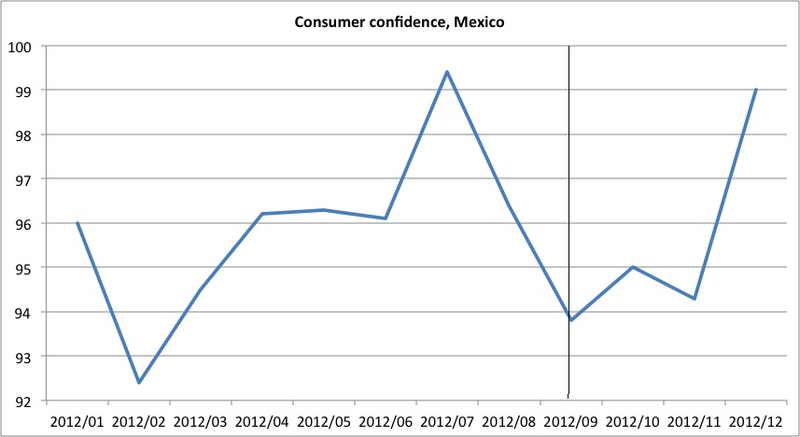 Then in 2008 we of course hit the Zero Lower Bound. From the Autumn of 2008 the Mankiw rule told us that interest rates should have been cut to somewhere between -4% (the original rule) and -8% (the re-estimated rule). This is of course is what essentially have justified quantitative easing. Since early 2011 the Mankiw rule – both versions – has been saying that interest rates should become gradually less negative (mostly because the US unemployment rate has been declining) and maybe most interestingly both the original and the re-estimated Mankiw rule is now saying that the Fed should hike interest rates. In fact the re-estimated rule has just within the past couple of months has turned positive for the first time since 2008 and this is really why I am writing the this post. Maybe we can use the Mankiw rule to understand why the Fed now seems to be moving in a more hawkish direction – we will know more about that later this week at the much anticipated FOMC meeting. I have to admit I like the Mankiw rule for its extreme simplicity and because it is useful in understanding historical Fed policy actions. However, I do certainly not think of the Mankiw rule as an optimal monetary policy rule. Rather my regular readers will of course know that I would prefer that the Fed was targeting the nominal GDP level (something by the way Greg Mankiw also used to advocate) and I would like the Fed to use the money base rather than the Fed funds rate as its primary monetary policy instrument, but that is another story. The purpose here is simply to use the Mankiw rule to understand why the Fed – rightly or wrongly – might move in a move hawkish direction soon. PS One could argue that the Mankiw rule needs to be adjusted for changes in the natural rate of unemployment, for discourage worker effects and for the apparent “drift” downward in the US core inflation rate since 2008. Those are all valid arguments, but again the purpose here is not to say what is “optimal” – just to use the simple Mankiw rule to maybe understand why the Fed is moving closer to rate hikes. PPS One could also think of the Mankiw rule a simplistic description of the Evans rule, which the Fed basically announced in September 2012.